James Whale's creepy classic gets a new 4K restoration. If Karl Freund (The Mummy) brought a European artistic sensibility and Tod Browning (Dracula) American ghoulishness, James Whale brought a very British wit to the Universal horror movies of the 1930s. His movies have the misty moors and dark shadows Universal horror is famous for, but thanks to his stock company of talented (Claude Rains, Boris Karloff, Charles Laughton) and often very camp (Ernest Thesiger, Una O'Connor) British players transplanted to Hollywood from the London stage, they're populated by a very English breed of eccentric. Perhaps this explains the failure at the US box office of his sixth feature, 1932's The Old Dark House. Arriving a year after his hit adaptation of Frankenstein, it likely frustrated American audiences who expected more of the same. The Old Dark House proved a hit in Whale's homeland however, where its oddball cast and class commentary would have no doubt struck more of a chord. I have to confess I share the frustrations of the American moviegoers of 1932 when it comes to Whale's film, not because I don't appreciate its distinctively British campiness and eccentricities, but because it doesn't revel enough in such elements for my tastes. Whale introduces a winning set up, with three travellers - Philip Waverton (Raymond Massey), his wife Margaret (Gloria Stuart), and their gooseberry friend Roger Penderel (Melvyn Douglas) - getting their car stuck in a landslide in rural Wales and seeking refuge at the titular nearby fixer-upper. They're initially greeted by the alarming sight of a bearded and wild-eyed Karloff as Morgan, the house's mad butler, before being introduced to the residents, Horace Femm (Thesiger) and his sister Rebecca (Eva Moore). While Horace is happy to have their company, Rebecca isn't shy about protesting unwanted guests. Also arriving at the house after being similarly caught in the storm are working class entrepreneur made good William Porterhouse (Laughton, whose portly appearance and heavy Lancashire brogue gives the impression of a '30s Peter Kay) and his female companion Gladys DuCane (Lilian Bond). As the evening progresses, and stories of 102-year-old fathers and mad brothers are spun, the assembled guests find romance and danger in the corners of the creaky mansion. Adapted from J.B. Priestley's novel 'Benighted' by playwrights and prior Whale collaborators R.C. Sheriff (whose WWI set play 'Journey's End' had been adapted by Whale for his 1930 directorial debut) and Benn W. Levy (whose play 'A Man with Red Hair' Whale had appeared in as an actor, playing the son of a character performed by Laughton), The Old Dark House opens with some crackling dialogue as its various players feel their way around each other, making allies and enemies along the way. Thesiger is a joy with an over-the-top performance that feels like a dry run for his unforgettable turn as Doctor Pretorious in Bride of Frankenstein three years later. He has a way of imbuing a simple question like "Would you like a potato?" with both menace and charm. Cast against type, Laughton is intriguing as a boorish capitalist with a tragic past - his performance reminiscent of Robert Armstrong's sozzled castaway in another 1932 screen tale of stranded would be victims, the superior The Most Dangerous Game - but he's sidelined for much of the drama. The Old Dark House commits the mortal sin of teasing us with a top-notch ensemble of character actors like Thesiger, Laughton, Karloff and Moore, only to shove them aside in favour of the more physically attractive but far less engaging Massey, Douglas and Stuart (the latter taking advantage of the pre-code years by swanning around in her undies). The film's horror elements are almost forgotten about for a while as the narrative shifts to an unconvincing and uninteresting romance between Douglas and Bond, who laughably begin to hear church bells ringing after knowing each other for less than an hour. When the Femm's mad brother Saul finally makes an appearance, it feels rushed, like an afterthought to please the horror hungry American audience. 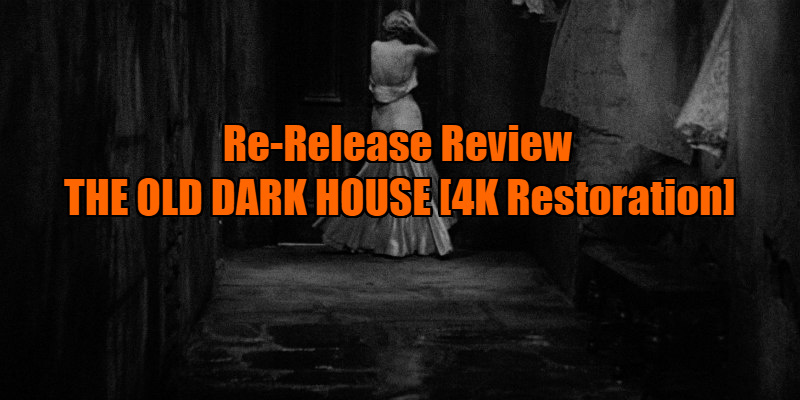 The Old Dark House is worth checking out for its early interactions between Thesiger, Laughton et al, and the occasional knowing moment of genre deconstruction - such as when Stuart uses the set's classic gothic lighting scheme to make shadow puppets - but otherwise it's a somewhat sedentary and second-rate entry in Universal's otherwise great second horror cycle. The 4K restoration is a huge improvement on previous editions, and spare a thought for late filmmaker and Whale protege Curtis Harrington, whose tireless efforts in restoring the film from its original negative have made such a re-release possible. 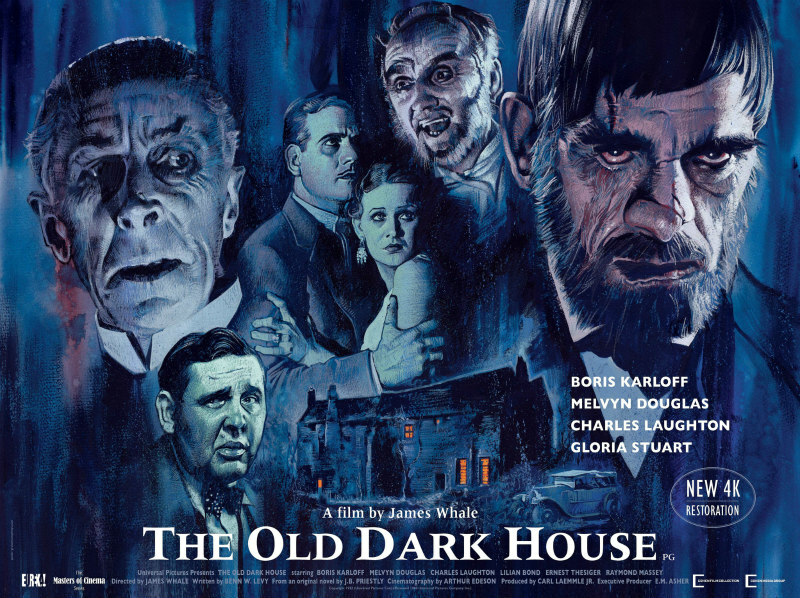 The Old Dark House is in UK/ROI cinemas April 27th and on dual format blu-ray/DVD May 21st.